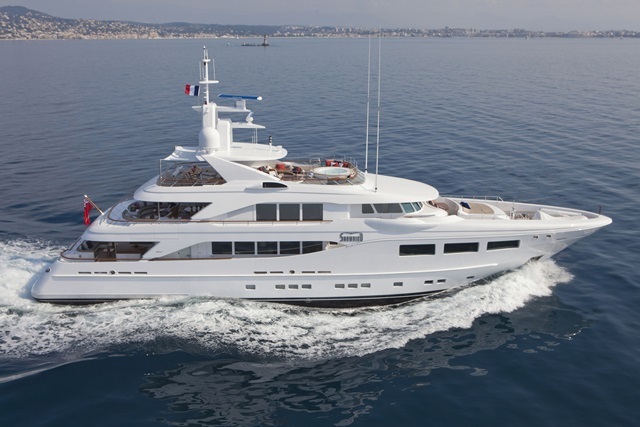 At the Monaco Yacht Show, which opens today, there are a good number of megayachts exhibited by builders and brokers at anchor, not just at the docks. Among them is SnowbirD, built by Hakvoort Shipyard in 2011. 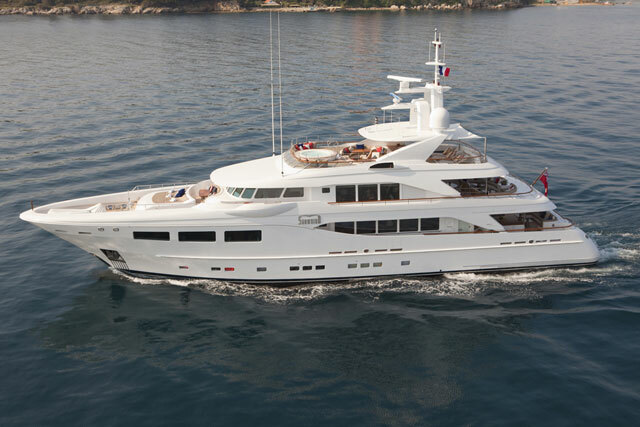 If ever there were an argument for a custom yacht being a work of art, this Lloyds-classed 127’10” (39-meter) megayacht is it. With interior design by David Ostrander, SnowbirD was created as a showcase unto herself as well as a showcase of her owners’ extensive art collection. 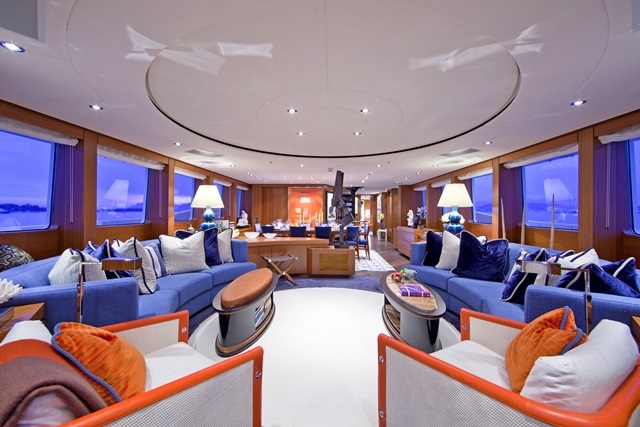 The megayacht’s skylounge is a good example. Note the large framed print at center fully forward, and yet another piece along the forward starboard side. There are even more works in the foyer leading away from here. SnowbirD has terrific works from famed modern masters like Robert Mangold, Frank Stella, and Sam Francis on this deck and her other two interior decks. Even the base of the bar, in the foreground of the photo, has been turned into a type of canvas. SnowbirD’s saloon, with an open floorplan including the dining area, really shows off the artistic approach. 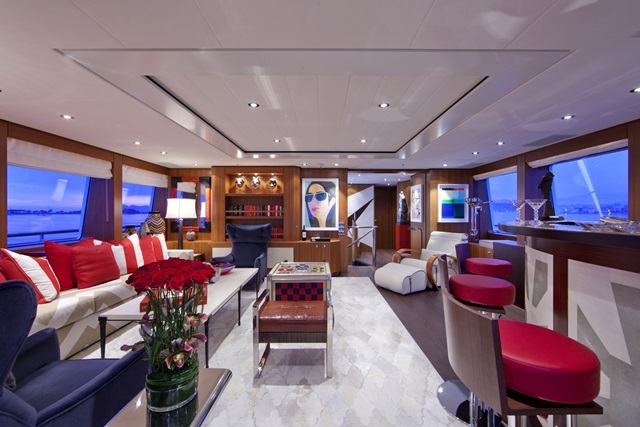 Ostrander, who heads Iluminus Design Group and is also the owners’ son, incorporates bright pops of color, which both echo nautical elements and complement the painting fully forward here, by Esteban Vicente (look dead center, at the large orange work). The 26’2” (8-meter) beam handily accommodates the large seating areas, the dining table for 10, and a cabinet between that contains a rise-up television. The steel-hulled SnowbirD was commissioned for moderate speeds and good range: a reported top end just shy of 13 knots at full load and a cruise speed of 10½ knots, powered by twin Caterpillar C18 DITAs, with range at cruise 3,800 nautical miles. 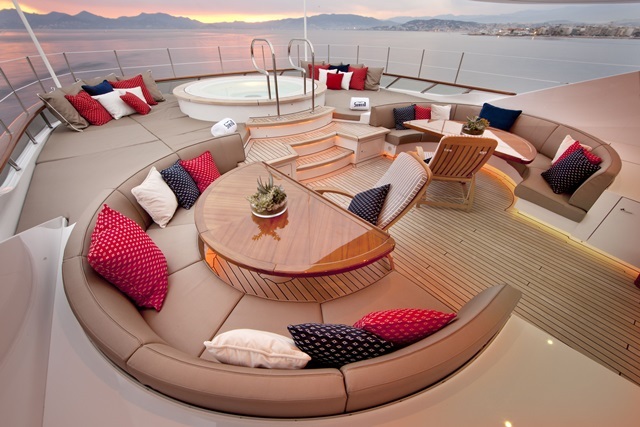 That means a wide variety of vistas are possible from here on the megayacht’s sundeck. Between the expanse of sunpads and the seating areas, and of course the hot tub, there’s abundant room to relax. Feel like lunch? No problem; a grill, refrigerator, icemaker, and even a wine cooler are contained in a teak-topped bar. 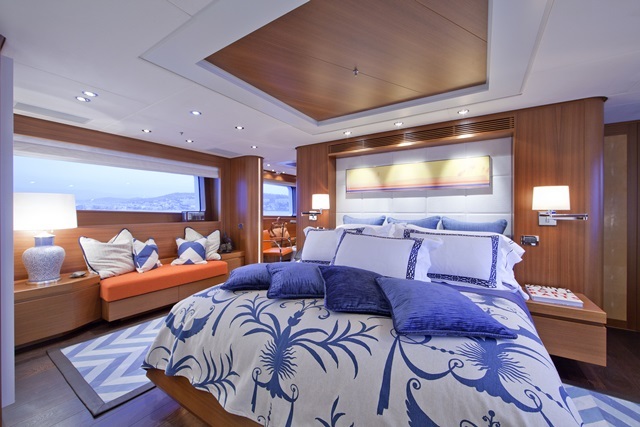 You can also rinse off before heading below decks, thanks to a shower overhead in the mast. With a round-bilge hull and a draft of 8’3” (2.55 meters), and naval architecture and styling contributions from Azure Naval Architects as well as Cor D Rover, SnowbirD has covered a good deal of cruising territory since her delivery. She’s available for sale via Edmiston as well as Hakvoort and available for showing by appointment.